RenaLife™ medium is optimized for the low-serum culture of Human Renal Epithelial Cells. RenaLife™ supports the growth of these cells over a period of at least 15 population doublings. RenaLife™ Basal Medium contains no antimicrobials and no phenol red. These supplements are available from Lifeline® but are not required for eukaryotic cell proliferation. 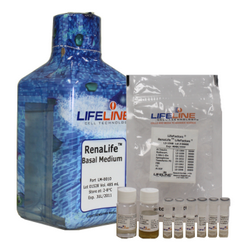 Kit format for formulation flexibility: RenaLife™ culture medium is offered in a kit format composed of RenaLife™ Basal Medium (500mL) and associated supplements and growth factors called “LifeFactors®.” This kit allows you to prepare fresh medium in your laboratory, extending shelf life and enhancing performance. Protective packaging: RenaLife™ Basal Medium is provided in a light-protected 500 mL bottle. The remaining LifeFactors®(growth factors and supplements) are packaged in a convenient gas-impermeable pouch for easy storage. Every production lot of RenaLife™ Medium is extensively tested using Human Renal Epithelial Cells to ensure lot-to-lot consistency. RenaLife TM Medium grows Human Renal Epithelial Cells through at least 15 population doublings at rates that are comparable to other commercially available low-serum media, while maintaining more characteristic epithelial morphology, e.g., more compact cuboidal shape, high refractive index and clarity of the cytoplasm. 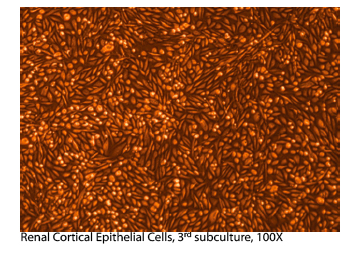 Shown left: Renal Cortical Epithelial Cells, third subculture (100X). Shown below: gamma-Glutamyltransferase (GGT) assay. The substrate (gamma-glutamyl-p-nitroanilide) and acceptor molecule (glycylglycine) are incubated with the cells in a sodium phosphate buffer for 30 minutes at 37°C. The released product is p-nitroaniline (PNA). The absorbance at 405 nm is measured and compared against a standard curve of PNA. Protein is quantified using a modified Bradford method.